...And their sons. This film had the unusual distinction of starring two "Jr."s, Lon Chaney and Noah Beery, both scions of silent film actors. 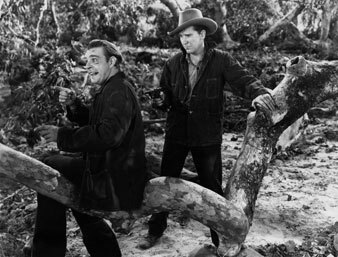 Everett Collection Lon Chaney, Jr., Burgess Meredith in Of Mice and Men 1939. Stars: Burgess Meredith, Betty Field, Lon Chaney Jr., Charles Bickford, Bob Steele, Noah Beery, Jr.
…And their sons. This film had the unusual distinction of starring two “Jr.”s, Lon Chaney and Noah Beery, both scions of silent film actors. The film Mice and Men (United Artists) is apt to reopen in the movie columns the critical discussion of John Steinbeck’s stunt story—so painstakingly has Lewis Milestone, producer and director, followed the original. There are small changes: Lennie is less stupid in the picture, and Curly’s wife has a bit more soul, but otherwise the plot and the lines are the same. Hollywood for once displays deep respect for a serious writer. Can it be that Mice and Men was from the beginning a Hollywood story? It is as a rule no virtue for the movie version of a novel or play to keep too close to the letter of the original. The film, as a different medium of expression, has its own laws. These are necessarily violated by mere photographic reproduction, however perfect it may be. Steinbeck’s story touched upon an important theme at those few points where the account of the clinical case left space: the loneliness of the farmhands and their longing for a piece of land of their own. Of course, one could not expect Hollywood to accentuate social themes. But on second thought I am not able to praise its shrewd capitalization of the sensationalism of the original. On the indicated level a marvelous job of production, direction, and acting has been done. That one is never really captivated by the Lennie of Lon Chaney, Jr., is not the actor’s fault, and it would be a gross injustice to call him the weakest of the lot. He is as good as if not better than Burgess Meredith as George, but no enduring interest can be held by the repetitious, unchangeable stupidity of the character he has to play. A broken leg or an undeveloped brain as such is not dramatic, and few people will persuade themselves into the suggested intellectual detour at the end of which, allegedly, Lennie stands as the symbol of a mysterious, childlike folk-soul. They will rather take their money’s worth in sentimental or melodramatic sequences and a few beautiful shots of wide farm land. They will get, besides—and in this respect the picture represents respectable progress—some realistic scenes of ranch life, which is usually romanticized. There is an unforgettable dinner sequence in which the girl (Betty Field) can no longer bear to watch or listen to her husband and father-in-law as they eat. The epigrammatic realism of this scene moved me more than the overplayed sequence in the bunk house where one farm hand after the other displays his good heart while waiting for the shooting of the dog. What is missing here is missing throughout the picture—sharpness and complete truthfulness. But I need not criticize John Steinbeck’s story again. Franz HoelleringFranz Hoellering was a soldier in the Viennese Army during World War I when he announced to his commanding officer that he was against the war. He was assigned to another post. He remained in Vienna after the war, and then moved to Berlin where he enjoyed a successful career as a journalist and editor. When Hitler came to power, he exposed the Nazi's intentions to go to war and then fled to Czechoslovakia when the Gestapo issued a warrant for his arrest. He eventually made his way to America where he resumed his career as both a film critic and novelist.